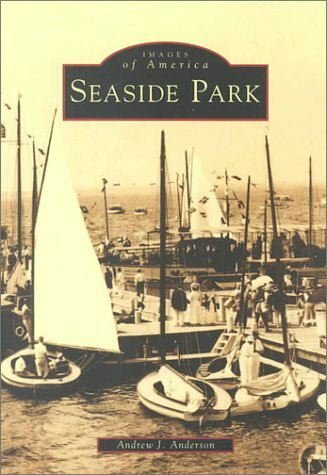 Authors of Images of America: Seaside Park & Sea Side Park Memories and Remembrances and the late mayor Jesse W. Anderson. The Borough of Seaside Park, located on the Barnegat Barrier Island in Ocean County, New Jersey, was first permanently settled in 1874. The area was called “Park City,” as the settlers wanted to build a seaside park. Unfortunately, the non-native trees from the mainland would not grow in the harsh barrier beach sand. Although there was to be no central park in the town, the name remained. Seaside Park was a section of Dover Township until the creation of Berkeley Township in 1875. The area then became known as the “Sea Side Park” section of Berkeley Township. Over the next twenty-five years, lots were sold, houses and roads were built, and the population of Seaside Park began to slowly grow. It was in March 1898 that Senate President Foster M. Voorhees, the acting governor, signed a bill making Seaside Park a separate borough. It was incorporated as “Sea Side Park.” Originally, the town ran from 14th Avenue to North Avenue, about half the size it is now. The area north of Sea Side Park, then known as the Berkeley Tract, was annexed by the Borough of Sea Side Park on or about May 12, 1900. As the town grew, the name of the borough lost a space. In 1914, a newly appointed town clerk wrote the name of the town as “Seaside Park” in the council minutes. This practice continues to this day. Grand hotels representative of the late gilded age were once the main attraction for vacationers from Philadelphia and New York. John Weaver, the first Commodore of the Seaside Park Yacht Club, founded in 1899, later served as mayor of the City of Brotherly Love. 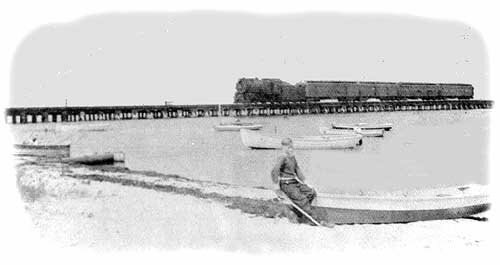 The Pennsylvania Railroad carried passengers and freight into Seaside Park from 1881 until 1946. The railroad tracks and the colossal hotels are no more, replaced by the automobile and affordable motels. The non-denominational Seaside Park Union Church, originally known as the “Chapel by the Sea,” was built in 1899. A Catholic Church, St. Catharine of Siena, soon followed. Both churches still have an active following. School classes for this small town were first held in a room above the general store before the construction of a schoolhouse in 1902. A volunteer fire company and first aid squad were also established early on. In South Seaside Park, a section of Berkeley Township, pound fisheries netted fresh fish for transportation to the Fulton Market. The Borough of Island Beach, now a state park, also had hotels and an interesting seaweed industry. Little exists but photographs and memories of this long gone era. The Life Saving Service played a key role in the development of the barrier island. Coast Guard stations were located approximately every three miles from Barnegat Inlet northward. Most of these buildings still exist and are now used for other purposes. The Toms River Station, located in Seaside Park almost directly across from the Toms River, is the town’s borough hall. Seaside Park was an isolated little town with a small year-round population. It had its own furniture showroom, several markets, five movie theaters, an auto dealership, and a blacksmith. With the construction of the Mathis/Tunney Bridges, the Garden State Parkway and development of Toms River, much of the town’s commercial needs were being met on the mainland. This once seasonal summer resort has evolved into a year-round community. The Borough seal was designed by the late Margaret Ernst Burke of Eighth Avenue. Mrs. Burkechose a blue background for the flag as symbolic of a connection to the sea and to complement the United States flag. The three colors for the seal were also symbolic: blue for nobility, gold for preciousness, and white for purity. The inner circle was divided into a trinity of land, sea, and air, represented by the native beach plum, striped bass and the seagull. The trinity is encompassed by a large gold circle, representing the sun and symbolic of eternity, without beginning and without end. The Toms River Life Saving Station No. 13 was originally located at May’s Corner, Decatur Avenue, and the Boulevard; William Miller became the first captain in 1872. 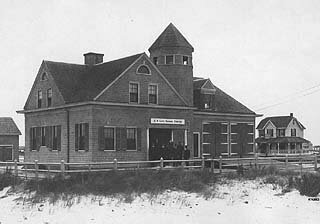 Construction on a “modern” Life-Saving Station on the oceanfront began about the time of the incorporation of Sea Side Park and was completed for the summer of 1900. The keeper was Elwood Rogers. The inside of the station consisted of a kitchen and one large room on the main floor with a big, long table where the crew ate their meals. There were seven men in the crew, and each man took his turn cooking; they even made their own bread. The second floor of the building was one spacious room where each man had a bed and a footlocker. From the tower, the watch would look for ships through binoculars. The boats were kept alongside of the building. In 1915 the Life-Saving Service merged with Cutter Service to form the Coast Guard; the station was redesignated the Toms River Coast Guard Station No. 109. It closed in July 1964; the building was sold to the Borough of Seaside Park in 1966. After the completion of a major restoration project on the old station, the borough offices were moved there in October 1996. The garage behind the building is used for storing lifeguard equipment, continuing the goals of the original Life-Saving Service. On July 4, 1881, the Pennsylvania Railroad made its historic first run from Philadelphia through Sea Side Park to Point Pleasant. Landowner Thomas Kennedy had granted a right of way to the railroad as it came across Barnegat Bay at Fourteenth Avenue and up Central Avenue. The first railroad station was in the Hiawatha Hotel; in 1882, a permanent railroad station was built between Fifth and Sixth Avenues on Central Avenue. The railroad brought passengers and freight into town for sixty-five years; fish from the pounds were shipped daily to markets in Philadelphia. On December 1, 1946, the railroad bridge linking Seaside Park with Ocean Gate was partially destroyed by fire, ending rail service to and from Philadelphia. In the fall of 1948, the Interstate Commerce Commission granted permission to the Pennsylvania and Atlantic Railroad to abandon its right of way between Toms River and Point Pleasant. The rails were removed from the island beginning August 20, 1949, to make more room for the highway and parking spaces. The railroad station was auctioned to the sole bidder, Albert A. Lukaisch, for fifty dollars; he moved the building to the southwest corner of Eleventh and Central Avenues. A new municipal complex was built at the former site of the railroad station and dedicated on May 8, 1953. Seaside Park Railroad Station, circa. 1910. Steam locomotive and train of cars. Pennsylvania Railroad just pulling out of the station at Central and Sixth Avenues. In center background is the boathouse of the late William Middleton, once State Treasurer. House north of the boathouses was built by William J. Erwin, of Philadelphia. Roof in the foreground is that Of the Bazaar (present B and B Store). (photo courtesy Mrs. Clifford Brown, from The 75 Years of Seaside Park by D. Gail Anderson, 1973). Education in Seaside Park dates back to the days when the borough was a small but growing seasonal resort. In the early 1890’s railroad stationmaster Henry Clayton felt that the local children should receive some education. He held informal classes for eight or nine children between train arrivals at the Sea Side Park Railroad Station, Sixth and Central Avenues. In 1894, the first formal school was opened in a small room over Franklin Harris’ General Store, Third and Central Avenues. The teacher was Stella Jeffrey, who made daily trips from Bayville. Attendance was up to twelve students. Over the next eight years, classes were held at various other locations. When the Borough of Sea Side Park was incorporated in 1898, classes were held in one room of the Fifth Avenue Hotel, which was located on what is now First Avenue. 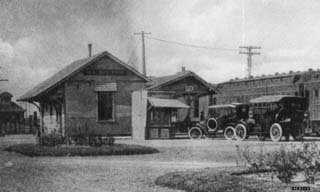 The school was later moved to E. W. Shinn and Company, a meat market on Central Avenue between Second and Third Avenues. The year-round population of the borough had grown to 73 people. On April 22, 1902, voters approved construction of a one-story schoolhouse with seating capacity for forty students, to be located on Fourth Avenue between Central and Bayview Avenues. Plans were approved by the State Superintendent of Public Instruction. The first principal was August Voigt, who taught 35 students from Sea Side Park, the unincorporated Seaside Heights, and Lavallette. Professor B. Gould became the new principal in 1915 at a rate of $80.00 per month, and a second teacher was hired the following year. The name of the borough was now being spelled “Seaside Park,” and the Seaside Park Public School ranked second among the schools of Ocean County in the average attendance of the pupils and in scholastic merit. There was, however, a continuing need for additional classroom space. The borough’s population had risen to almost 200 residents. Voters authorized a major addition and renovation to the schoolhouse, completed in the fall of 1917. A decade later, the classrooms were again overcrowded. The population of Seaside Park had grown to over 500 year-round residents. Voters once more went to the polls and approved construction of a completely new school. This “modern” schoolhouse was dedicated November 7, 1927. The 59 by 79-foot red brick building had four classrooms and a dramatically small library containing books on loan from the Ocean County Library. The unfinished basement often flooded when the bay was at high tide. Lester Gerhard of South River served as principal with two additional teachers assisting. The neighboring original wooden schoolhouse was then leased by the town for $1.00 a year for use as Seaside Park’s Borough Hall. The population of the borough continued to grow, from 653 in 1940 to 987 in 1950. When the red brick schoolhouse became crowded in the late 1940’s, a room in the original schoolhouse was used as a classroom. The Pennsylvania Railroad ended service to Seaside Park shortly after World War II. In 1953, the town’s new Borough Hall complex was completed at the former site of the railroad station. 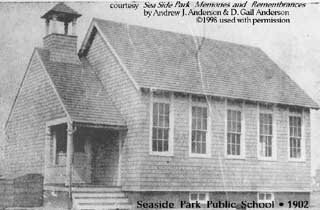 The original schoolhouse was returned for use to the school and designated the Seaside Park Public School Annex. Classes were held in the original wooden schoolhouse for another fifteen years. The building was later declared unsafe and demolished in August 1968. The Seaside Park Public School educated students from kindergarten through eighth grade up until June 1956. Graduating students then continued their education at Toms River High School, now Toms River High School South. In September 1956, Seaside Park became part of a regional school system with students in seventh through twelfth grade attending the Junior-Senior Regional High School in Pinewald, now Central Regional Middle and High Schools. The Seaside Park Public School continued teaching students in kindergarten through sixth grade. The borough’s year-round population had grown to well over a thousand residents. With the loss of the school annex, classes were again overcrowded. On December 17, 1968, voters approved the construction of a new Seaside Park Elementary School. When the larger schoolhouse opened in 1970, the old red brick schoolhouse was demolished to make room for the new school’s playground. The population of the borough continued to grow. With almost 1,800 year-round residents in Seaside Park, the Board of Education asked voters on February 20, 1979, to approve an addition to the existing elementary school. A larger office and additional classrooms were needed to comply with state directives. In April 1988, voters approved the purchase of the home and property of the late F. William Greger, Jr. A graduate of the Public School known throughout the borough simply as “Uncle Bill,” F. William Greger, Jr. was a lifelong resident of Seaside Park active in the volunteer fire company for 45 years and proprietor of his family’s White Oak Market until 1975. This building on the southwest corner of Central and Third Avenues became the Board of Education office and meeting room. In November 1995, the Seaside Park Elementary School library was dedicated as the “D. Gail Anderson Media Center,” becoming the first “named” room in the Borough of Seaside Park. Gail Anderson retired from the school in June 1995 after twenty-five years as a librarian. A lifetime resident of Seaside Park, she developed her passion for reading before she graduated from the old red brick schoolhouse in 1952. As a student in sixth grade, Gail volunteered to take care of the books in the very small library located above a stair landing. By the time of the centennial year of the Seaside Park Elementary School in 2002–2003, the borough’s year-round population had grown to over 2,200 residents. Although this population is thirty times larger than when the school was first constructed in 1902, the teachers today give the same personal attention to the children of Seaside Park as Henry Clayton, Stella Jeffrey, August Voigt, Professor Gould, Lester Gerhard, and all the other educators who served as the foundation for the educational system we have today. Horvath, Joan M. Seaside Park Yacht Club on Barnegat Bay: the First 100 Years . Seaside Park: Seaside Park Yacht Club, 2002. Miller, Pauline S. Three Centuries on Island Beach. Ocean County Historical Society, 1981.